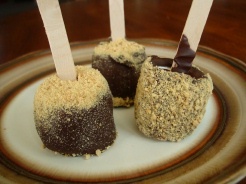 These Smores on a Stick are a great treat for backyard camping, sleep over or just for a fun tasty snack anytime! 1. Push a craft stick into each marshmallow. Don't push it all the way through, but push it in as far as you can. 2. Melt your chocolate chips in a small sauce pan over low heat, stirring frequently. Once your chocolate chips are all melted and runny, remove from heat and dip and swirl each marshmallow into the chocolate. Place marshmallows on a wax paper-lined plate. 3. While your chocolate is still wet you can either sprinkle the grahmn cracker crumbs over top, or put your crumbs in a bowl or paper plate and roll your marshmallows in them. Refridgerate for at least 1/2 hour or until the chocolate is set. Cover if you are storing these. One 12oz bag of chocolate chips will make about 12-15 smores. It's really important not to over melt your chocolate chips, otherwise they will "cook" and get too hard for dipping. If you have a double boiler it would work even better for dipping!